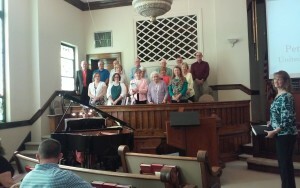 Petrie is very blessed to have an amazingly talented and committed adult choir. In recent years, many churches have opted to get away from having choirs and instead have gone to using praise teams to lead worship. At Petrie, we enjoy a full choir for leading our congregation in worship as well as for presenting special music. We practice on Wednesday evenings from 7pm – 8:15pm year round and affectionately call that time our “mid-week therapy session”. We sing together, laugh together, share joys and prayer concerns and then have an awesome prayer time together. Every Christmas season we present a full cantata and hold special rehearsals on Sunday evenings at 5pm for about 8 weeks prior to the performance. If you love to sing, laugh, and pray, please join us in this exciting ministry.